The Sexual Sterilization Act of 1928 conferred enormous powers onto a four-member Eugenics Board who were protected from any litigation and worked with considerable autonomy. Board members were government-appointed, and appointees reflected the conservative and social reformist values of the governments of the day (see Policy: Then). Because the appointments were for an unlimited term, there was little change in membership over the Board’s 44-year run. Two of four Board members were required to be medical practitioners, usually individuals working in psychiatry or as superintendents in the institutions themselves, which brought a strongly medical philosophy into Board matters. The terse, clinical language in the Board minutes shows how distanced and convinced of the value of their work Board members were. In hundreds of pages of Board minutes spanning 44 years of casework, there is virtually no mention of dissent or ethical discussion [1, 2]. The Eugenics Board was part of a broad government-run network engaged in controlling the sexuality of those deemed to be ‘unfit’. A 1937 Amendment to the Sexual Sterilization Act established a system of Mental Hygiene Clinics (later called Guidance Clinics). Two were permanent facilities in Edmonton and Calgary, but several times a year, ‘visiting clinics’ comprised of nurses, social workers and psychiatrists made much-publicized visits to communities around the province. One of their core mandates was to test people for mental defect and make referrals to the Eugenic Board. The people they saw were brought to them by family members, pastors and priests, school officials, and most frequently, family physicians. The Mental Hygiene Clinics became a network for monitoring and scrutinizing populations that professionals identified as being ‘at risk’, including ‘promiscuous’ teen and adult women, unwed mothers, sexually aggressive youths, and poor women and immigrants with large families [2, 3]. In addition, orphanages, Indian Residential Schools , and the child welfare/foster system also funneled children to the Eugenics Board. This demonstrates the pervasiveness of eugenic ideas, despite that it was shown very early on that sexual sterilization was neither a legitimate or effective way to improve the population [5, 6]. Although poor people, people of colour and new immigrants were targeted for sexual sterilization, intelligence was seen as a key ‘risk factor’ by Alberta eugenicists. The use of IQ tests was standard procedure in the institutions and the Guidance Clinics to determine ‘fitness’ for sexual reproduction. However, many of those tested – people who had been institutionalized long-term and not given a proper education and new immigrants, for example – lacked education or language skills that reflected their capabilities. Additionally, in our interviews with ex-workers, we heard that many of the IQ tests administered at Michener Center (the location of most of the involuntary sterilizations) were conducted by unqualified personnel . 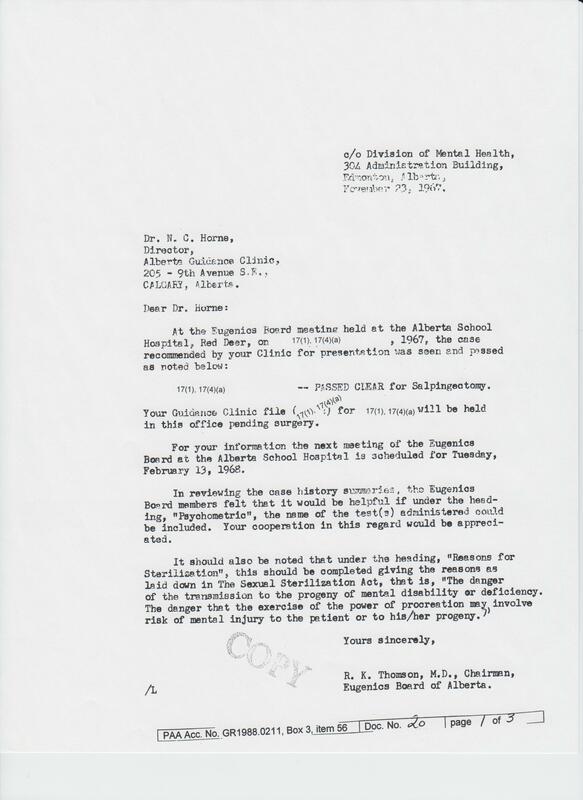 Survivors of Michener Centre and involuntary sterilization have described the procedures for being assessed by the Eugenics Board in very unsettling terms. Typically at puberty, residents were given a physical examination by an external doctor, including an examination of their genitalia – this was described as an embarrassing and frightening experience, because the professional was unknown to them, because it was a sexualized experience, and because there was no explanation offered for the examination. 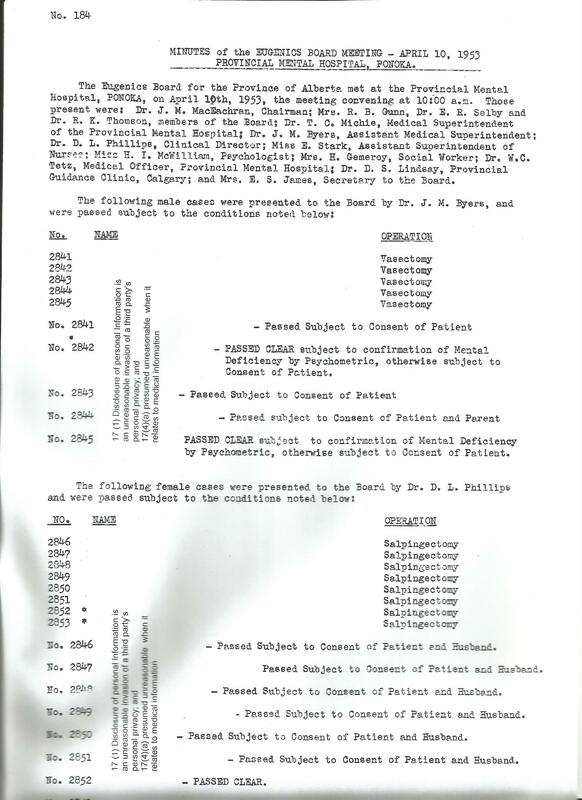 Several weeks after the physical, the children were interviewed by the Eugenic Board. They were asked questions about how to run a household, how to look after an infant, and what parenthood is like. These are questions that any child – let alone one who had been institutionalized for years and so had little experience of normal family life – would have difficulty answering. Thus, assessments of competency were based on questions posed under difficult circumstances with little hope for anything but a negative judgment. As noted elsewhere, once the Board heard a case, it was virtually guaranteed that they would recommend for sterilization. 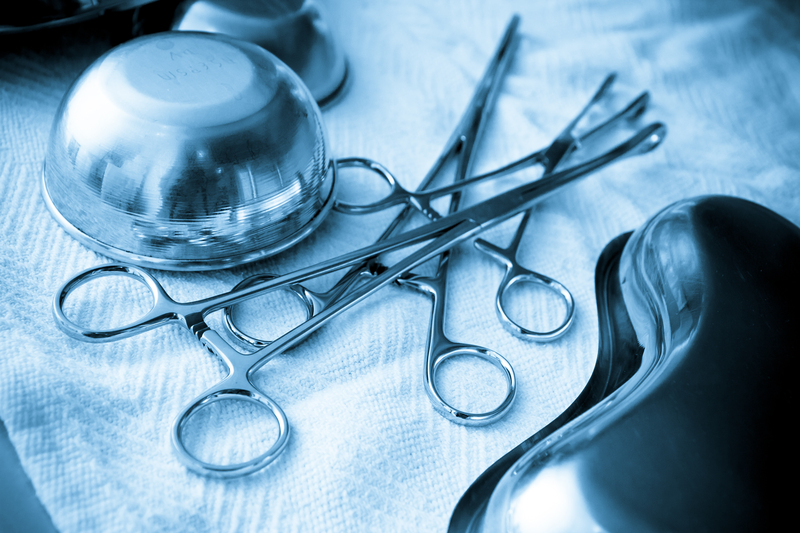 The sterilization procedures themselves were surrounded by mystery and deception for institutional residents. At Michener Centre, young people were told they were going to get their appendix out or that they were going for exploratory surgery, and many only learned as adults what had happened to them . Another form of deception attached to sterilization is that residents of institutions for mental deficiency and asylums for the insane were offered sterilization as a condition of discharge. In many cases, this turned out to be untrue, as many sterilized individuals remained in these institutions despite ‘agreeing’ to sterilization [7, 8]. Malacrida, C., A Special Hell: Institutional Life in Alberta’s Eugenic Years. 2015, Toronto: University of Toronto Press. Grekul, J., H. Krahn, and D. Odynak, Sterilizing the “Feeble-minded”: Eugenics in Alberta, Canada, 1929-1972. Journal of Historical Sociology, 2004. 17(4): p. 358-384. McLaren, A., Our Own Master Race: Eugenics in Canada, 1885-1945. 1990, Toronto, Ontario: MacLelland and Stewart,. Stote, K., The Coercive Sterilization of Aboriginal Women in Canada Journal American Indian Culture and Research Journal 2012. 36(3): p. 117-150. McWhirter, K.G. and J. Weijer, The Alberta Sterilization Act: A Genetic Critique. University of Toronto Law Journal, 1969. 19(3): p. 424-431. Lombardo, P.A., Three Generations, No Imbeciles: Eugenics, the Supreme Court and Buck vs. Bell. 2008, Baltimore, Maryland: The Johns Hopkins University Press.